Maverick is among Adda52’s biggest weekly online poker tournaments where players can win from the huge prize pool of INR 6 Lacs GTD. The website hosts this popular online event every Wednesday at 8 pm. The 15th November edition of Maverick was nothing short of an enthralling and adrenaline- filled experience for its participants. This week, the tournament attracted a total of 537 entries including 290 players and 247 re-entries from all over India. These players registered for the tournament with INR 1,100 buy-in with the aim to find their way to take away a large chunk of the gigantic prize pool. The intense and action-packed battle on the online felt ended at 3:55 am after more than 8 hours of grinding. Pranav Khandalkar aka “pkpok” won the first prize worth INR 1,01,351 by busting out top poker pros who are the best in the business. He conquered the final table by defeating well-known player Sanish Chabbra aka “sanish21” heads-up. Pranav and Sanish agreed on a heads-up deal as their chips were pretty much equal (Pranav had a slight chip lead). Sanish was also rewarded handsomely (Rs. 91,592) for finishing 2nd. The top 55 players finished in the money, who took home a minimum cash prize of INR 3,532. Mumbai-based Pranav is not a new name in online poker circuit and it was not his first notable score. He started playing poker as a hobby which later turned into his passion. Before adding the title of winner of Adda52 Maverick to his achievements, this 31-year-old player successfully cashed out in several poker tournaments on Adda52 and various other online poker platforms. Last month, he participated in Adda52 Millions INR 20 Lac GTD and reached the final table after beating a tough field. He fought really well and reached heads-up against an anonymous player “Zillastar”. 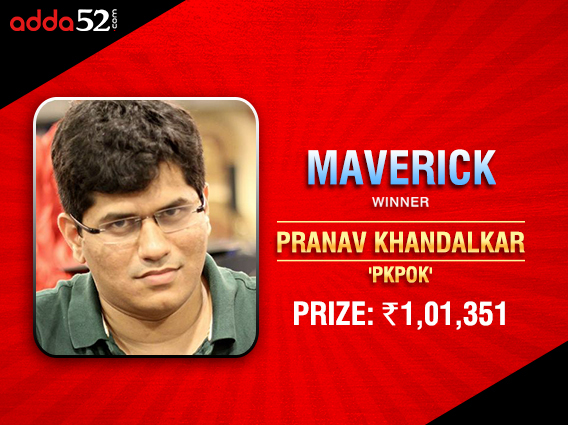 Pranav came to an agreement with him and walked away with INR 491,761 runner-up prize money. Sanish Chabbra is also a consistent online player who has many titles under his belt. He won Adda52’s Gayle Storm 3.0 INR 50 Lac GTD on 4th November by beating a field of 1,847 entries and earned the top prize of INR 6,89,742 prior to this. If challenges excite you, if you too want to make great profits by playing your favorite game of wits, don’t wait and participate in “Maverick” every Wednesday at 8 PM on Adda52 to win your share from the mesmerizing prize pool.